When I went off to college in 1973 I was a “young” 17 years old with a matching taste in music that primarily consisted of so-called heavy-metal groups like Led Zeppelin, Black Sabbath, and Robin Trower. Having never left the confines of the San Fernando Valley, my early experiences at UCLA were, to put it mildly, mind expanding. I joined the UCLA Computer Club as both an academic quest and social outlet. One of the first things I noticed about the culture of the highly intelligent members of the club was that they all had deep experience with classical music. The club had a makeshift stereo system that was always tuned to one of two classical stations available at the time here in Los Angeles (the only exception was when someone listened to the Dr. Demento show). I didn’t know what to think of what I perceived to be these rather unusual musical tastes. Why did these people only listen to classical music? What was it about classical music anyway that attracted them so? I reflected long and hard to make sense of the situation. It didn’t take long for me to experience my own awakening. Within months I found myself tuning the portable FM radio that sat just above my desk at home where I typically studied in the evening to a classical station. I started to “get it” with respect to classical music. I didn’t know any of the composers, and I didn’t recognize many of the pieces, but I appreciated the soothing melodies and found it actually helped me study my mathematics and physics. Ever since those early days, I’ve enjoyed classical music immensely, and I’ve had a lot of time to figure out why I decided to broaden my musical outlook. Classical music has a certain mathematical precision not found in other genres of music. My favorite composer is Mozart. Mozart piano sonatas are a perfect example of the intricate and delicate numerical convergence that underlies this class of music. I also like Beethoven, Brahms, Mahler, Chopin, and others for much the same reason. I feel that classical music and mathematics are closely tied. The notes serve to organize my neurons in the most delightful way. I can see why some people advocate playing classical music in the vicinity of unborn children. If the child’s auditory apparatus develops in the presence of mathematically precise music, it is no wonder that the child’s brain might be organized in a like fashion, or at least I like to think so. Last week, I gave an old college buddy and his wife tickets to a classical concert at the Hollywood Bowl because I was unable to go. The concert featured Mahler selections. He, like me, comes from a computer science background and has a long-standing appreciation for science in general. After the concert he e-mailed me an excellent analytical perspective of the night’s performance, one that made me feel as if I had been there. My point is that my friend, with a similar science purview as my own, saw the performance as a mathematical exercise and I appreciated his report very much. I estimate that any science or math enthusiast should entertain the idea of embracing classical music as artistic foundation of sorts for his or her scientific musings. It is a very enchanting path to follow. My own son, a boy I had to homeschool due to his extremely advanced academic needs, adores classical music and plays it beautifully, while leding his math and science courses among all older students. It's real. I am a Music Teacher and I truly enjoy the sciences. 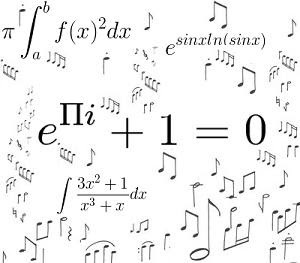 The connection between Music and The Sciences including Math is endless. I take every opportunity to inform my students of attaining a music education alongside other learning paths.